The most recent survey of the National Gardening Association, conducted in 2005 finds that gardening is more popular than ever. The report shows that 91 million American households (83%) participated in some kind of do-it-yourself indoor and outdoor lawn and garden activities. This sets a new record, and an increase of 11% over 2004, according to Bruce Butterfield, NGA’s Research Director. There are various levels of participation and expertise in gardening. Some people spend all their free time tending to their lawns, flowers, trees and vegetables. Many have a passion for plants while others have a casual interest. Horticulture has been my area of study, career and passion for much of my life. My first class was in high school. While attending college I took many courses in the plant sciences, and during summers I worked in a garden center and a floral shop. I earned a Bachelor of Science degree in Agriculture with a dual major in Horticulture and Agricultural Education. Upon graduation, I taught horticulture at the high school level for three years. While earning my Masters and Ph.D., I worked for an interior landscaping firm and was a Certified Interior Horticulturist. I also co-authored a college textbook and industry reference book, The Healthy Indoor Plant. When friends and family had plant questions, they came to me. With this formal education and work experience, I also had an enthusiasm for gardening at home. My husband, Mark and I took pride in the flower beds and vegetable gardens on both sides of our home. For our first three years of marriage, we planted new seedlings, mowed the lawn, pruned, watered and fertilized the landscape. Then one day things suddenly changed for me. I haven’t been able to garden for the past nine years. On June 13, 1998, while riding my bicycle, I was crushed by a 3 ½ ton tree and paralyzed from the waist down. Struck from behind, the 80-foot tall tree had me pinned and unconscious while Mark led the rescue. Several weeks later while telling the story about my injury, it occurred to me that there is a bit of humorous irony here — Horticulturist gets hit by a tree! I’m probably one of the few victims that know the botanical name of the tree that hit me: Tilia americana. I grieved deeply many losses with the onset of my spinal cord injury. One of the heartbreaks was the foresight that I would never garden again. When I came home from the hospital, the realization set in that grass is too difficult to roll across in a wheelchair. There are no sidewalks on the sides or in the back of our home. We also have no back porch, deck or patio for me to garden in containers. Gardening is limited from a seated position because most fl ower beds and vegetable gardens are at ground level and cannot be reached. If a person has the ability to get out of a wheelchair, gardening is possible but wearisome. Occasionally I have gotten out of my wheelchair, sat on the ground at the edge of the flower beds and planted seedlings with a hand shovel. 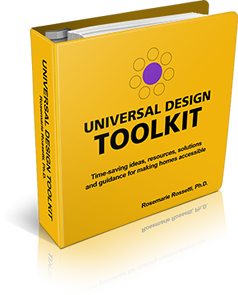 As I scooted along the ground and crawled on my hands and knees, I couldn’t help but think of how a universal design garden would make all the difference at my next home. These thoughts have been incubating since my injury. Now the time has come to put my thoughts into a landscape plan for our new home. Mark and I will be building a new home and garden that we will be sharing so others can borrow a few good ideas. 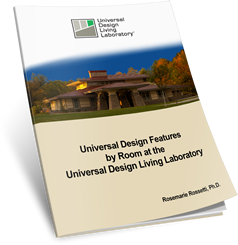 The Universal Design Living Laboratory (www.udll.com) is a national demonstration project in Columbus, Ohio. We are planning to start construction on May 1, 2008, and expect the project will take a year to complete. The house floor plan is designed and in the coming months we will be working with the landscape architect to design the garden. There will be sidewalks wide enough for my wheelchair to navigate around the exterior of the home. We envision a large patio in the rear of the home for containerized plants. These large containers of flowers, shrubs, herbs, and vegetables will be highly visible from the inside of our great room and kitchen. They will provide a source of colorful living artwork in the growing seasons. Because of their mobility, containers can be moved throughout the season, offering variety as the days pass. Place dollies under heavy pots to make them easier to slide around. For diversity, plants can be changed out with the new season. The atmosphere of an outdoor living space can be transformed. Container gardens are great for large or small spaces and accommodate people in wheelchairs especially well, allowing the seated gardener the opportunity to be independent.